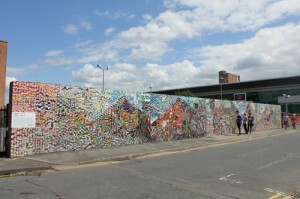 The LomoWall on Tariff Street. The world’s first permanent LomoWall has been erected – and Manchester’s Northern Quarter was chosen as the perfect location. One of the walls on Tariff Street is now covered in 14,000 lomograph photos, easily distinguished by their light leaks, lo-fi grain and distinctive blurriness. All images have a watery theme to tie in with the 2012 Canal Festival, with the official unveiling of the 30ft LomoWall taking place last Thursday 26 July to mark the start of the event, which features a range of activities along the canal from Calderdale into Manchester city centre. David Tester of Lomography Manchester said, “The theme of water was chosen as it fits in well with the 2012 Canal Festival and also as it reflects the surrounding area of the wall. The photos were generated via our online community and through workshops taking place at Lomography Gallery Store Manchester. Every photo that has been used has been taken in and around Manchester. We had a great response, as always, from our community”. The lomography photo mural stands on Tariff Street in the Northern Quarter. The sixth annual Canal Festival runs from 18 to 26 August and more information can be found here. This article first appeared on the Now Then Manchester blog.